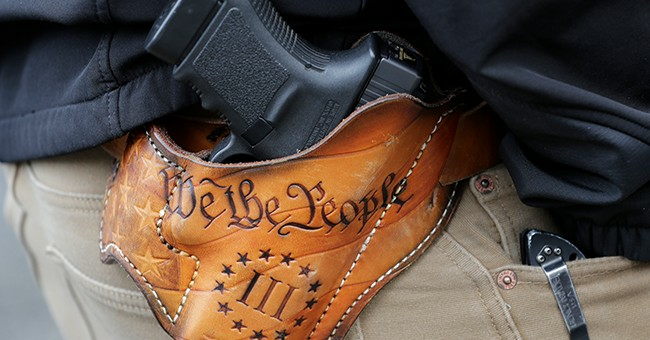 Texas House Speaker Dennis Bonnen (R) on Friday said Constitutional Carry is now dead in the Lone Star State. His declaration comes after gun rights activists showed up at his Lake Jackson home, where his wife and children were at. According to Dallas News, Texas Gun Rights' Executive Director, Chris McNutt, appeared on Bonnen's home because the Constitutional Carry bill was losing steam. Other pro-gun activists also allegedly made a stop at Reps. Dustin Burrows and Four Price's homes. “I could no longer watch as legislators and their families are incessantly harassed by fanatical gun-rights activists who think laws preventing criminals from carrying a gun should be repealed,” Bonnen said in a written statement, The Statesman reported. The Speaker said he was upset because legislators were in Austin while their families were back home. McNutt told said the reaction was over the top. "If politicians like Speaker Dennis Bonnen think they can show up at the doorsteps of Second Amendment supporters and make promises to earn votes in the election season, they shouldn't be surprised when we show up in their neighborhoods to insist they simply keep their promises in the legislative session," McNutt told Dallas News. McNutt posted a video message on Texas Gun Rights' Facebook page, saying Bonnen's move is "a desperate attempt to take the heat off of himself for blocking Constitutional Carry legislation." "He is trying to paint the simple act of leaving a flyer on the doors of hundreds of his constituents and donors – asking them to contact their legislators to support a bill – is somehow an act of intimidation," McNutt said in his video.